Water, liquor, and communism stirred Virginia E. Jenckes’s considerable passions and spurred her into elective politics, where she unseated a 16–year veteran Congressman to become the first Indiana woman to serve in the U.S. House of Representatives. Jenckes’s expressions of commitment to creating flood control for her constituents, abolishing Prohibition, and routing communist influences from American society made her one of the more colorful Washington politicians during the New Deal. Virginia Ellis Somes was born on November 6, 1877, in Terre Haute, Indiana, to James Ellis, a pharmacist, and Mary Oliver Somes. She attended public schools in Terre Haute and took one year of coursework at Coates College.1 In 1912, Virginia Somes married Ray Greene Jenckes, a Terre Haute businessman 34 years her senior.2 A year later, Virginia Jenckes gave birth to a daughter, Virginia. The couple operated a 1,300–acre family farm along the banks of the Wabash River in western Indiana. Ray Jenckes died in 1921, leaving his widow to manage the farm and raise their child. Flooding posed a constant problem in western Indiana. In 1927, a new dike along the Wabash River failed, threatening lives and Jenckes’s $15,000 crop. She mobilized local residents and participated in a 3,000–sandbag effort that successfully contained the breach. That experience led her to found and serve as secretary and lobbyist for the Wabash and Maumee Valley Improvement Association, an organization that proposed flood control programs and projects. In 1928, Jenckes achieved a major political triumph when party leaders adopted one of her association’s flood control plans into the Democratic National platform.3 Success emboldened Jenckes, and within several years she had committed herself to running for Congress. In the Democratic primary in May 1932 she unseated Gillen. In the general election, her 19–year–old daughter, Virginia, chauffeured her on a speaking tour that logged 15,000 miles.6 Jenckes faced Fred Sampson Purnell, an eight–term incumbent, who had represented the northern counties prior to redistricting. Purnell, who voted down a proposal to loosen Prohibition laws in the 72nd Congress (1931–1933), found himself in the political battle of his life as the Democratic Party embraced the repeal of the legislation. Jenckes ultimately prevailed with 54 percent of the vote to Purnell’s 46 percent. In Indiana the four GOP incumbents lost and the state’s 12–seat House delegation went all–Democratic, thanks to presidential candidate Franklin D. Roosevelt’s long coattails. Hoping to capitalize on farmers’ discontent with the Agricultural Adjustment Act (AAA), Purnell challenged Jenckes again in 1934. But she won by a hair’s breadth, polling just 383 more votes than Purnell out of 135,000 cast. With the implementation of the New Deal relief measures, Jenckes turned her attention to other matters. Her interest in stemming subversive activities in America dominated her work and made her something of a controversial figure in the nation’s capital. As a strong supporter of J. Edgar Hoover’s Federal Bureau of Investigation, she often defended the agency’s budget requests on the House Floor. She also was an unremitting anticommunist. When many government buildings were erected in the 1930s without provision for display of the American flag, Jenckes suspected a conspiracy and introduced a measure requiring that the Stars and Stripes be flown atop every federal building.19 Jenckes pursued her anticommunist crusade by using her seat on the District of Columbia Committee to expound on the dangers of communist indoctrination in the public schools. 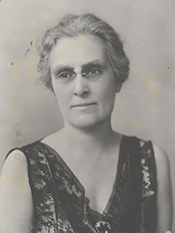 In 1935, she supported an amendment—later dubbed the “red rider”—to a D.C. appropriations bill which outlawed the teaching, advocacy, or mere mention of communism in the capital’s public schools.20 She locked horns with New York Represen–tative Fred J. Sisson, who introduced an amendment to repeal the “red rider.” Sisson claimed that Jenckes made her allegations without “a scintilla of evidence.”21 Jenckes would not relent, however, warning that “Washington is the hotbed of international propagandists.”22 The dispute eventually brought Jenckes into conflict with other committee members, including Chairwoman Mary Norton of New Jersey. In May 1937 the House overwhelmingly repealed her amendment. Retiring from Congress in early 1939, Jenckes settled in Washington, D.C., where she volunteered extensively for the American Red Cross.24 She helped five priests escape Hungary during the 1956 uprising, setting up a behind–the–scenes network and funneling communist opposition messages to then–Secretary of Defense Charles E. Wilson. Late in life she returned to Indiana and eventually resettled in her native Terre Haute. After a long life of public service, Virginia Jenckes died in Terre Haute on January 9, 1975, at the age of 98. 1Susan Lennis, “Virginia Jenckes: A Hoosier Ex–Congresswoman Reminisces,” Indianapolis Star Magazine, 7 December 1969: 48–53. 4“Indiana Democrats Nominate Two Drys,” 6 May 1932, Washington Post: 5. 5Hope Chamberlin, A Minority of Members: Women in the U.S. Congress (New York: Praeger, 1973): 97–98. 6Until her daughter Virginia’s tragic death from tuberculosis in September 1936, she was a constant companion in Washington, serving as her mother’s unpaid office secretary and keeping house in their rented apartment. Lennis, “Virginia Jenckes”: 48–53; “Rep. Jenckes Succeeds Gillett as the Bridge Ace of Congress,” 28 April 1935, Washington Post: SMB7. 7Charles Stewart III, “Committee Hierarchies in the Modernizing House, 1875–1947,” American Journal of Political Science 36 (No. 4, November 1992): 835–856. 8Terre Haute Tribune, January 9, 1975. Established in 1889, the Interparliamentary Union is an international organization of sovereign states with the aim of promoting peace, cooperation, and representative governments. 9“Roll Call on Beer Bill,” 15 March 1933, New York Times: 3. 10Labeling flood control projects in her district as one of her “pets,” Jenckes requested that $18 million of the more than $3 billion marked for public works and recovery projects be set aside to pay for and prevent damage caused by flooding in her district. “Mrs. Jenckes Wars on Flood Peril,” 19 January 1934, Washington Post: 11. 11Congressional Record, House, 73rd Cong., 1st sess. (24 May 1933): 4093–4094. 12Congressional Record, House, 73rd Cong., 2nd sess. (15 June 1934): 11889. 13Congressional Record, House, 74th Cong., 2nd sess. (20 February 1936): 2512. 14“Mrs. Jenckes, Indiana, Is Home Protagonist,” 24 January 1935, Washington Post: 12. 16Ibid., 49–50. Jenckes also resented First Lady Eleanor Roosevelt’s efforts to promote close women friends for Congress. 17Congressional Record, House, 73rd Cong., 2nd sess. (9 June 1934): 10962–10964. 19Congressional Record, House, 74th Cong., 1st sess. (8 February 1935): 1761–1762; see also, “Ex. Rep. Virginia E. Jenckes, 97, Indiana Anti–Communist, Dead,” 10 January 1975, New York Times: 40. 20“Congress to Debate Communism Issue,” 17 May 1936, Washington Post: B1. 21“Sisson Scores Jenckes’ Stand on Rider Issue,” 10 March 1936, Washington Post: 1; Congressional Record, House, 74th Cong., 2nd sess. 22Congressional Record, House, 75th Cong., 1st sess. (11 February 1937): 1161; James D. Secrest, “Teacher Foes of Red Rider Are Assailed,” 12 February 1937, Washington Post: 17. See also, Jenckes’s statement in the Congressional Record, House, 75th Cong., 1st sess. (11 March 1937): 2130–2132. 23“Congresswomen,” 12 November 1938, New York Times: 14. 24Peggy Preston, “Ex–Congresswoman Jenckes Says Walk for ’War Nerves,’” 3 November 1942, Washington Post: B7; see also Lennis, “Virginia Jenckes”: 48–52. Papers: 1918-1951, 2 linear feet. The papers of Virginia Jenckes include correspondence, reports, and other papers relating to agricultural waste recovery and other efforts to help farmers during the Depression, flood control on the Wabash and White rivers, railroads, women's rights, education, and communists in America, particularly Virginia Jenckes's opposition to communist radio broadcasts. The papers also contain political correspondence, campaign materials, newspaper clippings, and papers relating to a meeting of the Inter-parliamentary Union which Virginia Jenckes attended. Oral History: 1967, 88 pages. A transcript of an interview with Virginia Jenckes conducted by Tom Krasean from October 11-12, 1967. Papers: In the Theodore Dreiser Papers, ca. 1933-1940, 3 folders and 1 bound volume. Correspondence from R. D. Heinl, dated April 15, 1935 to Theodore Dreiser. In the letter, R. D. Heinl mentions Virginia Jenckes. Papers: In the William H. Benjamin Papers, 1935-1936, 86 letters. Subjects covered include Virginia Jenckes. An unpublished guide is available in the repository. Oral History: 1972, 88 pages. A transcript of an interview with Virginia Jenckes conducted by Tom Krasean from October 11-12, 1967. "Virginia Ellis Jenckes" in Women in Congress, 1917-2006. Prepared under the direction of the Committee on House Administration by the Office of History & Preservation, U.S. House of Representatives. Washington: Government Printing Office, 2006.